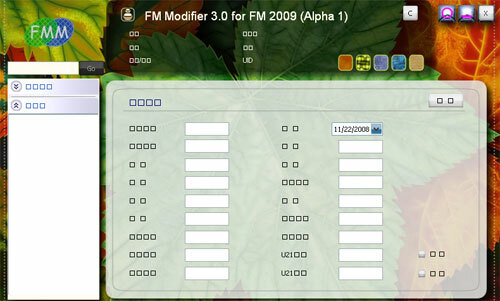 FM Modifier for FM 2009. FM Modifier is a popular save game editor that lets you change finances, stadiums, kits, players, heal injuries, contracts and lots more with ease, while the game is loaded. More details will be added later. At the moment, there is only a Chinese version available. first of all..open the editor. type in the player's unique ID code on the top left hand box. Then click "C" on the top right hand of the editor. the basic information of the player should appear. Now, starting from the top left box is "current ability" moving downwards, they are "potential ability"
top right is the "D.O.B"
the bottom 2 check boxes are "injured" and "banned" respectively. Thanks to grumman020 for description! Looking for FM Modifier for FM 2008? 49 comments have been posted so far. thanks for you help monkeyme! go options, preferences, display and sound and then show unique ids. Then view the player you want and you will see it. just copy it down. hey excuse me, but i don't understand what you mean with the unique ID code??? ehm maybe its not 9.3.0 compatible. grumman020, thanks for the description! and lads so far what i have heard there is not gonna be any FMM anymore. hi guys, i know chinese and i hope i can help u with this. first of all..open the editor. type in the player's unique ID code on the top left hand box. Then click "C" on the top right hand of the editor. ye but usin stuff like this is basically cheatin! u gotta take the blow if ur players get injured! i had 9 1st team players injured for valencia n still doin ok! u just gotta take the blow boys! humm we really need it in ENGLISH! try fm editor instead, i have heard that the maker of this editor wont be doing anything else to it. wow are you serious, this isn't even funny, its just so stupid. Handcrafted in Symi, Hellas. Page created in 0.586 seconds.